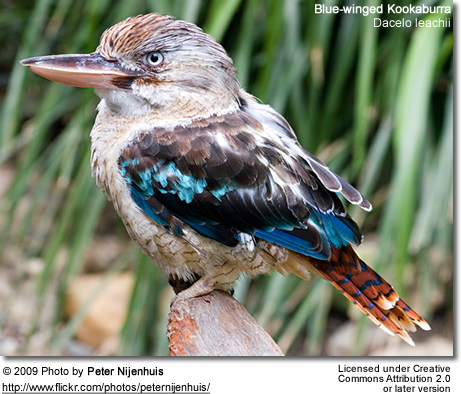 The Blue-winged Kookaburras (Dacelo leachii) are large kingfishers commonly found in northern Australia and southern New Guinea. 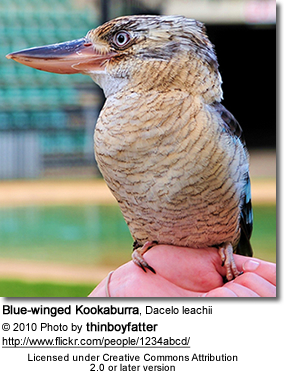 The Blue-winged Kookaburra's range stretches from southern New Guinea and the humid parts of northern Australia, to the vicinity of Brisbane in southern Queensland across the Top End, and south along the Western Australian coast to Shark Bay area. They are not found Broome and Port Hedland in northwestern Australia. Well known and established in its vast range, they dwell in open savannah woodland, forests, Melaleuca swamps (a tree in the myrtle family) and Paperbark swamps, farmlands, and sugar cane plantations. They are usually seen in groups of 12. Found on Melville Island and the adjacent mainland. Found in southern New Guinea. They measure about 38 to 42 cm (15-17 in) in length (including the tail) and weigh 9.2 - 11.6 oz (260 to 330 g). 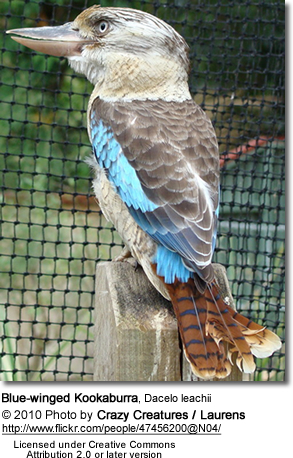 The Blue-winged Kookaburra's upper plumage is mostly brown, except for the bright metallic blue markings that cover most of the surface area on the wing. The rump is also blue. The head and the plumage below are cream-colored with brownish barring and markings on the head, around the neck and on the sides. The beak is bi-colored: the maxilla (top part) is blue and the mandible (bottom part) is tan. 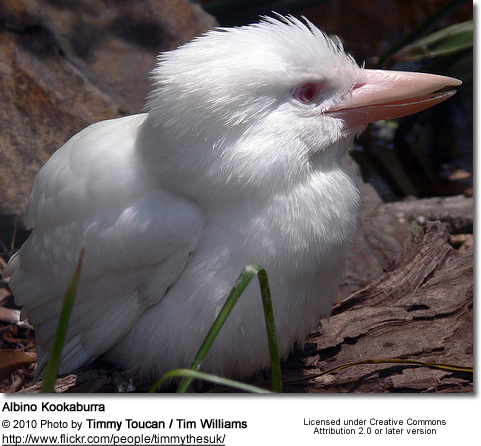 The first Albino Blue-winged Kookaburras were discovered in North Queensland on Dec. 7, 2010. They were found in a new nest in Queensland's far north. The staff at a wildlife sanctuary south of Cairns were caring for what they have called "a miracle sent from heaven" after the two six-week-old siblings were blown from their nest during a storm. Gender ID: Males have blue tails, while the females' are rufous-colored with blackish bars. Juveniles have predominantly brown eyes for the first two years; and they have more prominent brown bars and marks in the plumage, and their eyes are predominantly brown for the first two years of life. 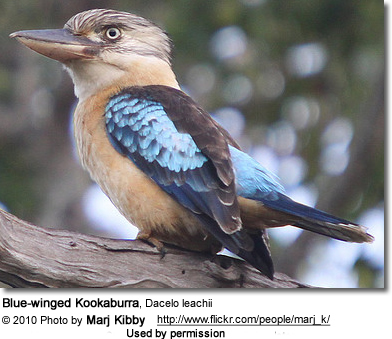 In areas of Eastern Queensland, where the Blue-winged and Laughing Kookaburra’s habitats overlap, it can be difficult to distinguish between the two species. The call of the Blue-winged is more abrasive than that of the Laughing, and it ends rather abruptly. 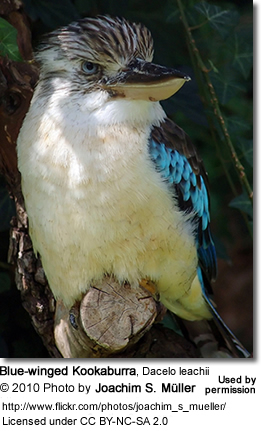 The Blue-winged Kookaburra's call is a high-pitched trill. The call has been described as a maniacal cackling or barking. 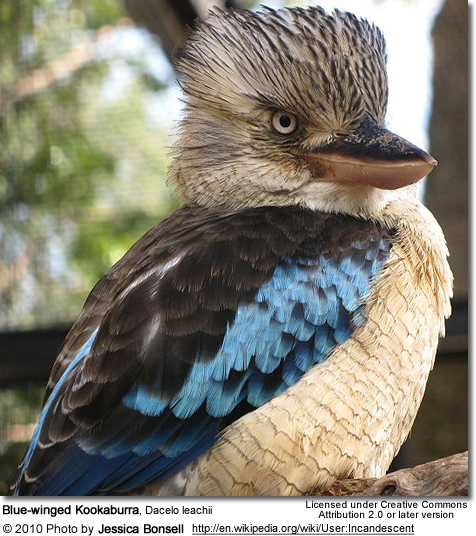 The Blue-winged Kookaburra preys upon a wide assortment of animals that live on or close to the ground. 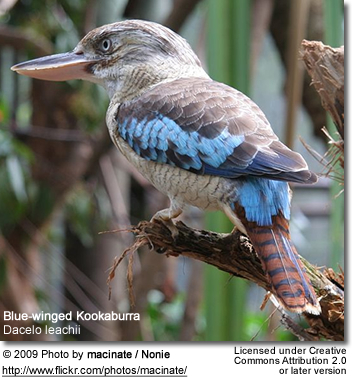 The diet of the Blue-winged Kookaburras changes with the season. In Australia’s summer, when their territories experience the rainy season, they will consume mainly insects, lizards, and frogs. During the drier seasons (the winter), their diet is comprised of crayfish, scorpions, spiders, fish, snakes, earthworms, small birds, mammals and rodents. 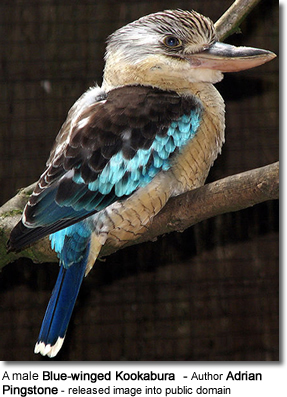 The Blue-winged Kookaburra is famous for its snake-hunting technique. The bird will capture a snake behind the head and bash it against a branch or rock to kill it. Swallowing it is not that easy, however. It takes the snake into its mouth headfirst, but the rest of the prey’s body hangs out of the mouth while, little by little, the bird slowly digests it! This explains why the crop is so low in the body—between the legs! The Blue-winged Kookaburras engage in cooperative breeding. There can be as many as 10 "helper birds" (mostly the young from previous seasons) assisting the parents in raising the young. Breeding begins in late September, Australia's Spring season, and it extends to December. 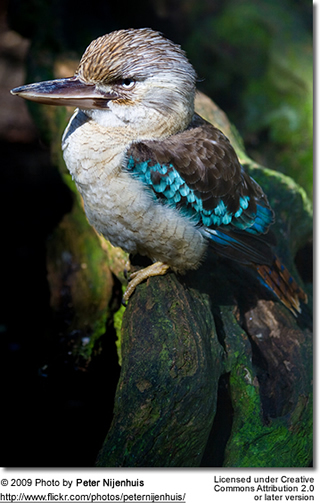 Blue-winged Kookaburras typically breed only once a year. They nest in cavities situated high up in trees, about 25 m (80 ft) or so above the ground. The average clutch consists of 3 or 4 white slightly shiny eggs, each measuring about 44 x 35 mm in diameter. The female alone incubates the eggs for around 26 days. The female will then lay three or four white, shiny eggs. The female will spend 26 days incubating the eggs. Like all birds, the chicks break their way out of the egg with an egg tooth on the bill, which they lose a few days after hatching. They hatch helpless - naked with pink skin color and blind. On the seventh day, pinfeathers begin to appear, and on the tenth day, the chicks are able to open their eyes. Kookaburra chicks tend to be highly aggressive in the first week, and youngest chick is often killed by the older chicks. They fledge (leave the nest) when they are about 36 days old. However, the juvenile birds still need to be taught how to hunt by their parents for a further 6-10 weeks before they are independent.